I decided to update all my sketching equipment. To renew a bit. There is nothing like a bit of fresh air. 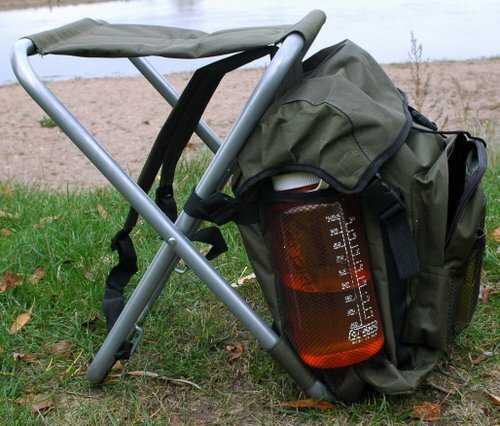 I came across this little fishing stool and bag, which only cost 13 euros and works PERFECTLY. It can be carried by hand or as a backpack an your bag fits right next to you with everything right there at hand. Nothing falling over in the mud or calming it between you feet, and you can have your bag to you left or right. There ar two compartments on the sides and two on the front and it can carry large sketchbooks. It carries high enough on the back, not to put strain on my lower back and all is waterproof. I’ve sketched in the mud arrived at home and gave it a wipe and the underneath of the bag was clean. There are even more fancy bags, but they cost a fancier price as well. To me, this is a perfect sketching “outfit” – ligthweight a bag and stool in one, econimical and functional. I bought it a Decathlon, a big sports store here in France. It is also available on some fishing equipment sites on internet, but not at that price. I would suggest you visit some fishing stores close by, or google fishing bag and stool. 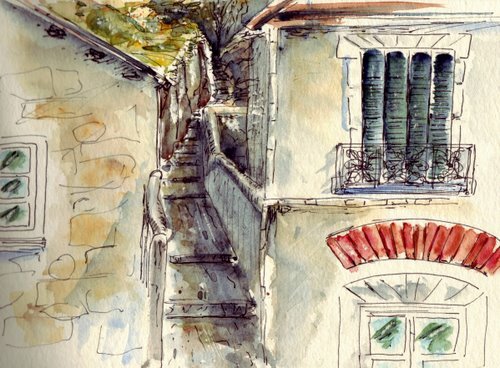 Some sketches – done in pen, graphite and watercolour in sketchbook. Always fun to stop by your blog. Your sketches are so free and fresh. Thanks for sharing them. That does look like a good setup, Ronell–and if these beauties were created on it, then you’ve sold me on it! I love your puddles. It is not easy to do something like that. Did you get your stool on the web by any chances?? It seems perfect! Napabelle…thanks for asking…I fogot to add the links etc, so I updated the site, with a reference to a website. I found a mini-version of your stool in our local grocery store during hunting season. 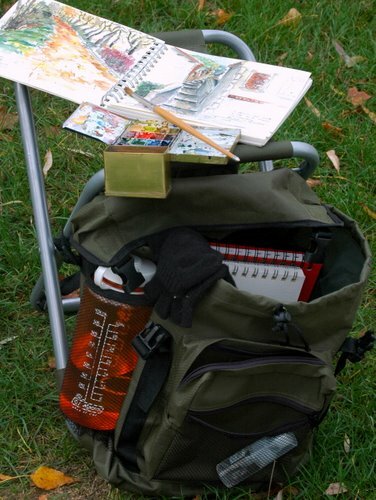 The bag is part of the under seat and is not much bigger than a fanny pack, but it will hold several items that are only 6 inches by 4 inches, OR one 5-inch by 7-inch sketchbook and a small sketch kit. It has a a shoulder strap. USA $16… I am amazed that you can haul a bag that size into beckoning landscapes. I feel quite wimpy with my own, just going into the back yard. Great! Just envying the stool and the Loire! I’ve seen people with similar set-ups – a few months ago a photographer was at the Botanic Gardens and had his lenses,etc in an angler’s bag. It’s a smart idea. No doubt that stool contributed to the relaxed feel of all these beauties! I’m going to check this out. Nice post! Love seeing your set up and equipment ronell!! I absolutely looooove your last one!!!!!! and thanks for the tip (stool + bag), I’m going to subtly talk about it to my hubby. Maybe he’ll get my hint, he never knows what to offer me!! Love your village painting – wonderful simplification and such a terrific suggestion of sunlight! What a good idea to post this. I too use a stool but it’s not attached to my backpack. I got mine for just a few dollars at REI which is ‘the’ place for sport/recreation equipment on my side of the country. Maybe I’ll try to get a snapshot of my set up for all to see too! Your sketchercise sketches are fabulous!!! Love the setup and your sketches! Very nice! You look like you’re definitely ready for plein air painting!!! 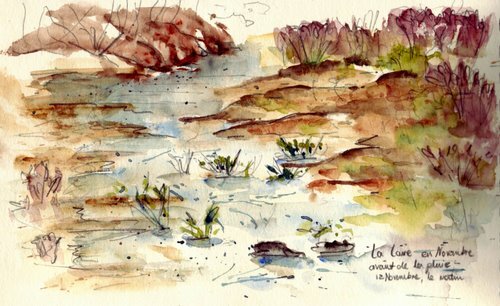 I like your Loire sketches below, especially after having visited and painted in the area back in October. We stayed in Amboise. You are lucky to be in such an inspiring area! Monkey see monkey do,,,,I just bought one of these on ebay. They are hard to find in the US. Can’t wait! I love how your delicate line plays with the bold color! OOoh, what a delightful series of images here! It makes me want to visit Paris immediately. I really enjoyed feasting my eyes on your latest sketches, Ronnel. 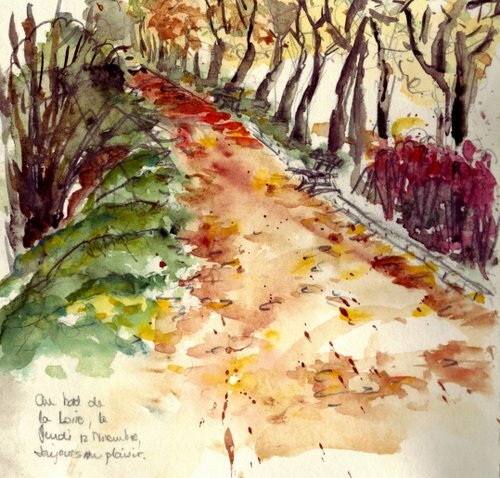 Your sketches are very beautiful but i like your trees and road painting very much.